The LXE 8650 has been renamed to the Honeywell 8650. Washable, wearable system fits right or left hand, and can be fitted to the wrist or back-of-hand. The LXE 8650 family of Bluetooth Ring Scanners include both laser and imager industrial grade ring scanners connected to an ultra-light weight Class 2 Bluetooth radio module. The entire package fits comfortably to the back of your hand and weighs less than a cell phone. Compatible with Windows CE, WinMobile, and XP computers. 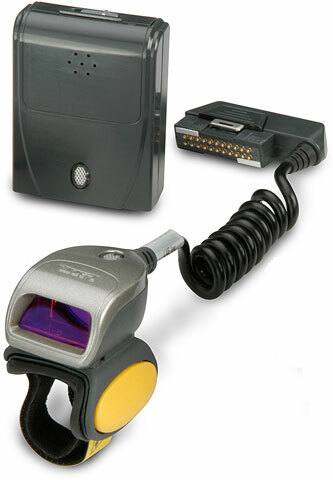 8650, Bluetooth 1D/2D Imager Barcode Ring Scanner Kit with Windows XP Wedge software. Kit includes 1D/2D imager ring scanner, back-of-hand Bluetooth radio module, battery, and two hand/wrist straps (1 large 1 small), and ItemSightXP-w Windows XP Wedge CD. 8650, Bluetooth Laser Barcode Ring Scanner Kit with Windows XP Wedge software. Kit includes 1D laser ring scanner, back-of-hand Bluetooth radio module, battery, and two hand/wrist straps (1 large 1 small), and ItemSightXP-w Windows XP Wedge CD.